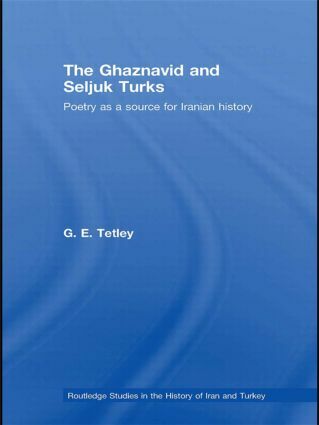 This new view on aspects of the Ghaznavid and Seljuk dynasties concentrates on the relationship of the panegyric poets Farrukhi Sistani (c.995-1032) and Mu'izzi (c.1045-1127) to the Ghaznavid and Seljuk rulers and dignitaries for whom they wrote. Dr Tetley investigates the reliability of the historical information which may be gathered from the poems, and draws comparisons with other historical sources. A solid and impressive work of learning, of interest to scholars in Oriental Studies, Medieval Literature, and History, The Ghaznavid and Seljuk Turks: Poetry as a Source for Iranian History, is the first extended English study of Mu'izzi it presents much new material concerning both this little-studied poet and also the better-known Farrukhi. Additionally, there is a valuable exploration of the relationship between Persians and Turks, a highly significant factor during the rule of the two dynasties.